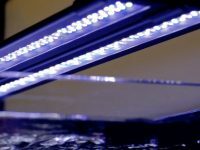 Current USA Satellite Plus PRO is a dedicated LED light for aquarium plants which supports the healthy growth of aquatic plants from low to high light levels. 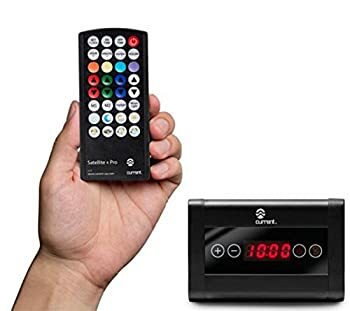 The product is constructed to enable simple operation, high output light delivery, flexible color adjustment, and easy to operate user-friendly control feature. 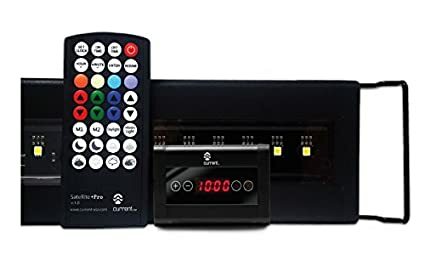 Moreover, the Satellite LED Plus PRO owns a 24-hour on/off feature which brings the convenience of use due to automatic operation with free-hand control. 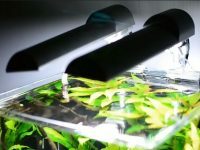 Regular indoor light can not support plant growth in aquariums. Therefore, it’s necessary to provide artificial lighting to mimic natural conditions. The Satellite Plus PRO LED light is designed to be perfect for most planted freshwater tanks. It boasts a high-output LED light delivering high PAR so as to support the growth of plants in planted tanks. To make sure that the fixture provides enough light to promote the healthy growth of plants, it comes fitted with high output 6500K LED bulbs with RGB color combination. Further, its 120-degree optical lens allows proper light spread and penetration all over the aquarium giving a stunning look due to sparkling color rendition. As a result, the fixture is suitable for all plants even the most demanding ones. 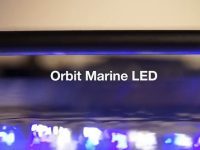 Follow the information from the manufacturer – Current USA, the Satellite Plus PRO LED light is ideal for most types of aquariums including fish only tanks (both freshwater or saltwater) and planted tanks with low to high light level plants. Controlling LED lighting fixtures should not be a complicated work with the Satellite Plus PRO. For convenient use and automatic operation, the product comes with a 24-hour timer control for free hand control. This feature allow you to program what time to switch between daylight and moonlight of a day. 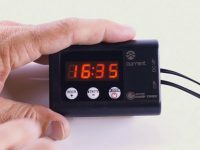 In order not to shock your plants because of the sudden changes of light modes, the 24-hour timer function offers 15-minute fading periods between two different modes. This feature stimulates the effects of sunrise (ram up) and sunset (dim down) in your aquarium. The programming is straightforward with the remote. First, set clock by pressing the SET CLOCK button, a setup screen will blink for 3-5 seconds. Then, press HOUR+ until current hour is reached and press MINUTE- until current minute reached. Press ENTER to save current time. To set On and Off times, press on the corresponding buttons. Then press HOUR+ and MINUTE- until your desired times. Remember to save the setting by pressing the ENTER button. 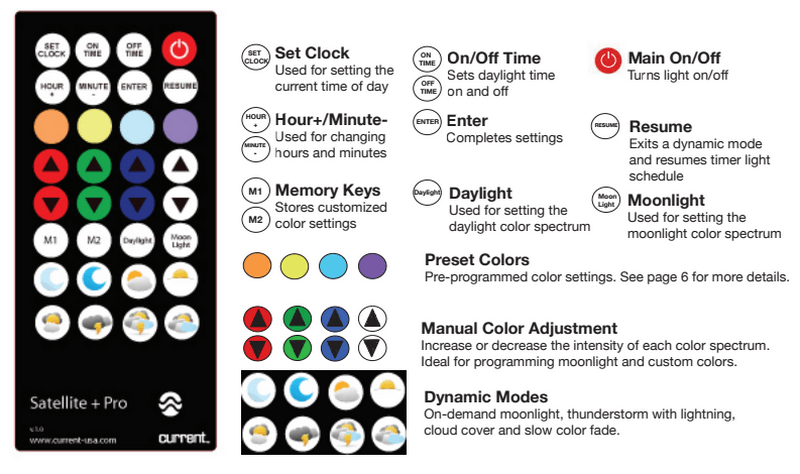 The Current USA Satellite Plus PRO fixture offers you the ability to adjust its daylight and moonlight color spectrum and intensity to work with its 24/7 timer function. Thanks to that, you can fully customize the light to achieve the most calming colors while providing enough lighting for your planted tank. For adjusting the daylight, press Daylight button. Then, choose any of four preset colors ; these are pre-programmed lighting modes for different fish tank types. The orange key represents for sunlight, which provides lower K spectrum like 6500K, is for planted tanks and fish with orange and yellows. If you have a heavy planted aquarium, I strongly recommend the yellow key, which provides full color spectrum including white, red, green and blue at maximum power. The crisp blue key is for a very crisp white light with a hue of blue (similar to a 10,000K spectrum) for cichlids and some specific fish types. The purple key represents for deep water color (a combination of white, a bit of blue and red) that makes many aquarium fish “pop” in color. After choosing your preferred color, you can immediately use it as the daylight for your aquarium or customize it to reach the most desired color. By using up and down arrow keys , you can enhance or lower the intensity of particular colors (red, green, blue and white) to reach your aspired color spectrum and intensity. When your desired color is achieved, hold the Daylight button for 5 seconds to save the setting. A light will flash to indicate your setting is stored in the memory. Press RESUME button and the light will go back to 24-hour schedule, T-ON will display on the screen. For establishing moonlight, the manual is absolutely same to the daylight setup procedure. For easy handle, you should firstly turn all colors off by pressing each down arrow key for 10 seconds. Now, depending upon your preference, you set the moonlight by increasing blue light less or more. One or two clicks of the blue up arrow key is enough to create a perfect moonlight. If you don’t want to use the 24 hour timer mode, the Satellite Plus PRO LED light is also available with various lighting and weather effects for you to choose. Cloud cover, evening lightning storm, lightning storm with fading color cloud, evening clouds. These colors effects are meant to create an attractive tank appearance and a natural like experience to your fish and plants. They are pre-programmed and ready to use by only pressing the dynamic mode button you want. For exiting the dynamic modes, press RESUME button and the light will return to 24 hour timer mode. The Current USA Satellite Plus PRO LED light also offers the ability to create and store your own color effects to use at any time you want. Take your attention the two memory slots – M1 and M2, these buttons help to save and call your latest lighting colors. To build a color: press either M1 or M2 -> choose a pre-programmed color spectrum -> use the up and down buttons to reach your desired color spectrum and intensity -> hold M1 or M2 (like one in your first step) for 3 seconds until the light blinks to indicate the custom color is stored. Now, you can call your custom color spectrum at any time you want by pressing the M1 or M2 button. To exit the custom color and put the light back in timer mode, press RESUME. 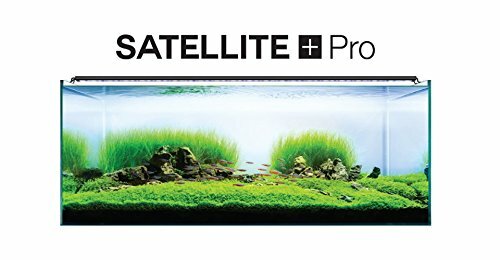 For freshwater planted aquarium, Satelite Plus PRO LED light proves to be a perfect pick. It’s a premium product which suits all fish tank plants due to its high PAR rating. The excellent light penetration and easy customization render it a must-have product for all aquarium enthusiast. 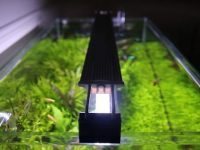 Overall, this fish tank LED light is ideal for improving the beauty of your tank while also improving your fish without compromising their health.